For the first time that I can remember, Artistry is staging a musical in their smaller black box space, and a play in their larger traditional theater space. 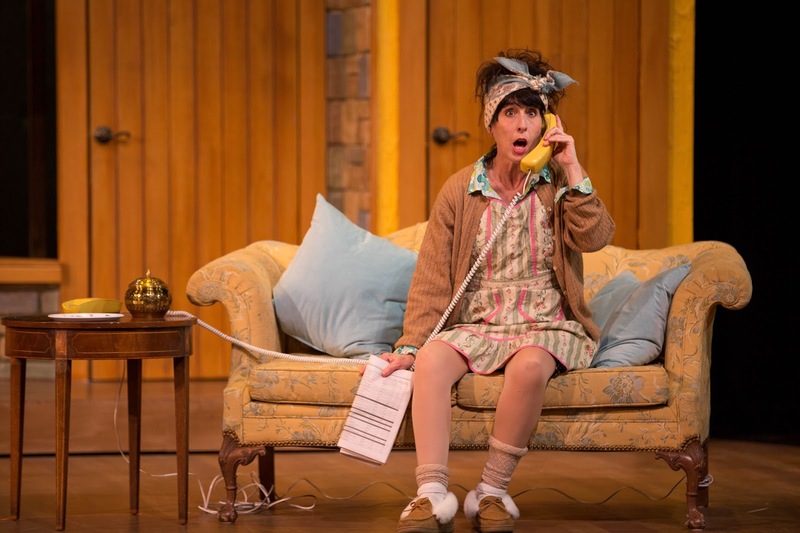 It makes perfect sense when the musical is the intimate two-hander The Last Five Years, better served by a smaller space and smaller elements of production, and the play is the hilarious back-stage farce Noises Off, which requires a huge rotating set. The switch pays off, with a nearly sold out run of L5Y, and a rollicking good time in Noises Off. The utterly delightful cast, directed by Artistic Director Benjamin McGovern, plays up the ridiculousness of the script to maximum effect. And all of the theater insideriness will make me wonder what's really going on backstage when a play starts late. Noises Off was written by English playwright Michael Frayn in the early '80s, and it literally shows us what's happening backstage during the production of a play-within-a-play called Nothing On. 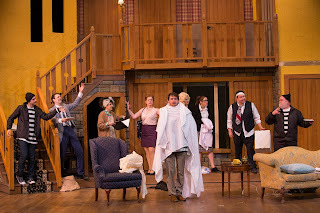 The first act is the final dress rehearsal for the play, in which the director continues to give notes to the six actors, as they figure out what to do with their props. Act two is a month into their tour, and shows us the play from backstage, with the set turned 180 degrees around. Things are not going so well for our troupe of actors, with affairs, drinking problems, and all kinds of silly misunderstanding wreaking havoc on the performances. Finally, the final act turns this around again to the stage again, even further into the run, when everything has gone off the rails and they barely get through the show. It's a wildly entertaining ride. The nine-person cast is so consistently great in this true ensemble piece that it's impossible to single anyone out. They all have their moments, and stay true to the quirkiness of their character, as well as the character that character is playing. Part of the fun is they get to practice bad acting in the play-within-a-play (particularly Emily Sue Bengston, whose character has a robotic acting style that never varies, no matter what her scene partner does). Another part of the fun is they all speak in varied British accents, which somehow makes everything funnier. The cast also includes the always hilarious Angela Timberman as the veteran actor who puts her own money into the show and is having an affair with another actor (I just discovered this play was made into a movie with Carol Burnett playing this role, which totally tracks); Caitlin Burns as the elegant Belinda, trying to keep the cast together; Ernest Briggs as the delicate actor who gets a nose bleed when he sees violence (of which there is much in this play, but of the jokey not-real stage variety); Fred Mackaman as the unpredictable and hard of hearing alcoholic everyone has to keep tabs on; Jamie Case as the put-upon stagehand Poppy; Neal Skoy, an adept physical comedian reprising his role of the clueless stagehand from the 2012 Jungle production; Paul Rutledge as the posh gentleman actor who can't quite find the words; and Riley McNutt as the harried director who walks through the audience in Act One, trying to juggle his actors and his relationships. There's so much going on in this play, especially in the second act backstage, that it's impossible to see everything. Several times I had the experience of watching the action on one corner of the stage when half of the audience bursts out in laughter, causing me to look around the stage to see what they were laughing at. At any moment there are two or three things to laugh at, and you're lucky if you catch one. But that's a good problem to have. 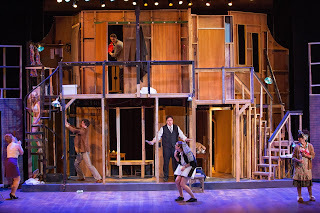 A show like this relies on a good set, and Rick Polenek delivers with a two-story English country home with so many doors (more doors = more funny) that is just as interesting to look at from the back. And kudos to the real stagehands who help make the magic work. I haven't come to the theater to hear about other people's problems. I've come to be taken out of myself, and, preferably, not put back again. Which of course isn't totally true, theater is a great way to explore and expose the problems of society. But it also kind of is true. This is definitely the kind of play that takes you out of yourself, while laughing at imaginary people's imaginary problems. 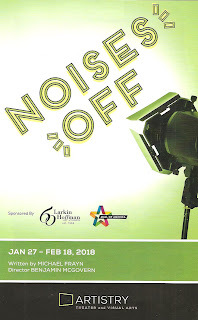 The silly and fun farce-within-a-farce Noises Off continues at Artistry in Bloomington through February 18.